True to his first will, Honeymoon continues his development, using traditional construction techniques. The self-assemblies permit to minimize the use of screws and sticking. 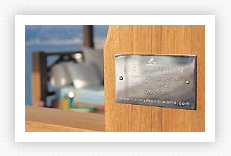 The other materials necessary for the assembly are made of brass and stainless steel. 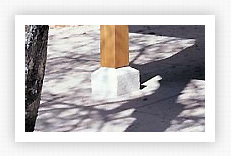 In order to isolate them from moisture, the wooden feet should be slightly raised by tire-substantive or metal plates. In some cases, the plates can be dressed with cement which can be dyed at the request so that it builds on the existing environment. Thanks to his dense fiber, his fine grain and his vanilla color, teak is a wood greatly appreciated by lovers of lumber. In addition, Teck is the wood most stable and more sustainable whatever levels and variations in temperature and humidity. 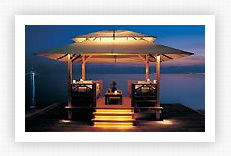 All Honeymoon creations are made of teak, with the exception of joists, manufactured in Bangkirai, another tropical wood with close properties. 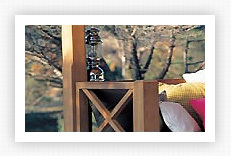 To meet the requirements of security and reliability, Honeymoon’s structures may be equipped with a standard electrical kit, including a dimmer switch of a circuit breaker, lanterns fisherman and / or directional lighting more contemporary style. Each model can be equipped with electrical system depending on demand. The coverage so-called "Mediterranean", with a double level, was designed to facilitate ventilation and offer a wide resistance to the winds. The navy canvas, with which it is manufactured, was developed specifically according to our criteria of resistance and quality. Thus it resists perfectly winds up to 90 km / h. Beyond that, it must be dismantled: the dismantling is done fairly easily with its stainless steel fasteners and his inner sleeves. 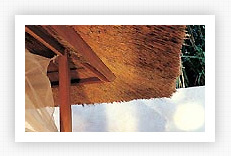 Our traditional roofs are made of stubble or any other local material. 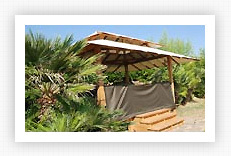 Such coverage gives our structures a tropical style incomparable… In Europe, we propose to carry out the roofs with reeds of Camargue. 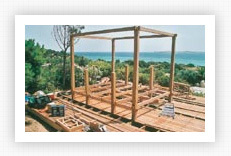 A craftsman will install it shortly after mounting the structure. The coverage of a small garden bed needs more than 800 kg of reeds. 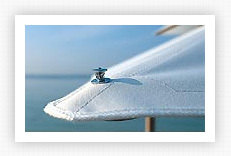 This type of coverage is perfectly watertight and offers a thermal heat and sound without equal. Its lifespan is about 30 years. For countries outside the EEC, we offer a tropical style roof made with a synthetic fibber or natural materials that can be found locally. Each model of the range Honeymoon comes with a protective cover which protects mattresses and pillows during absences of short duration. In winter, even if it is not necessary, the sheet will provide better protection. 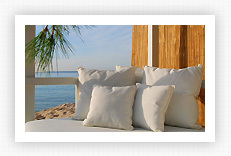 All our mattresses and pillows come with removable covers in Sunbrella or Glentuff outdoor fabric. These materials are perfectly stable outdoors and they fear nor humidity nor the sun. Stainless steel 304 offers irreproachable durability; its mechanical and aesthetic qualities make of it a material sought for high-end applications. No maintenance is needed.